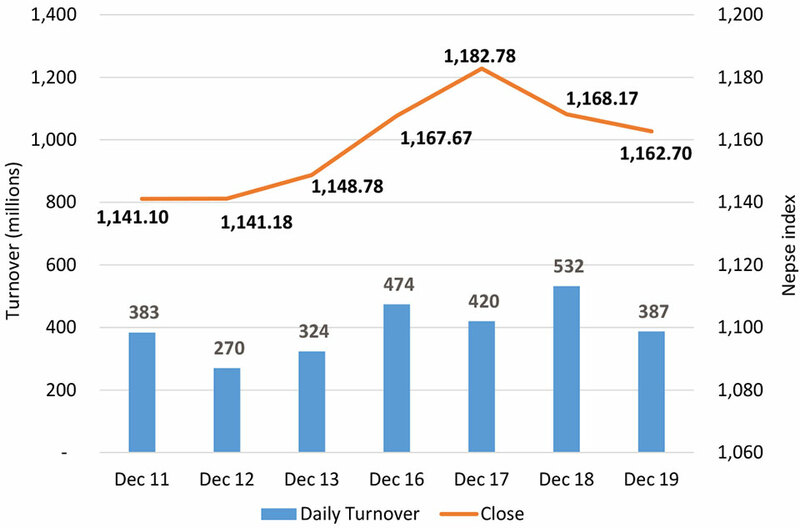 KATHMANDU, Dec 20: Weakness from the preceding session got carried over to the initial trading on Wednesday, causing the benchmark equity index slump almost 10 points in the beginning trading hour of the day. The index briefly traded slightly higher in the afternoon, clawing back all its earlier losses. Nonetheless, the Nepal Stock Exchange (Nepse) index struggled towards the closing hours to end the day with a loss of 5.46 points at 1,162.70 points. The local equity market witnessed a downturn for the second day in a row amid lack of any upbeat news regarding the capital market. The fall in the index was also partly fueled by profit-booking by traders following gains in the past weeks. 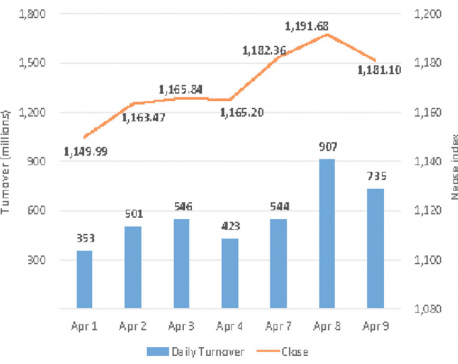 Meanwhile, daily turnover dropped to Rs 387 million compared to Rs 532 million in the previous day. Major sub-indices ended the session mixed. Most of the gains came from development bank scrips. The group's sub-index climbed over 1 percent. Similarly, Non-Life Insurance, Finance, and Manufacturing and Processing sub-indices also closed slightly higher. On the other hand, banking stocks came under pressure as the respective sub-index dropped 0.84 percent. Life Insurance and Microfinance sub-indices followed with loses of 0.67 percent and 0.45 percent, respectively. Sub-indices of Hotels, Hydropower and 'Others' segments also closed in the red. Nepal Life Insurance Company Ltd and NMB Bank Ltd were the most actively traded scrips on the day with turnovers of over Rs 35 million apiece. Next on the list of actives, Nepal Investment Bank Ltd registered a total transaction of Rs 23 million. Meanwhile, Global IME Bank Ltd Promoter Share and Mega Bank Ltd logged in turnovers of Rs. 22 million and Rs. 20 million, respectively. Mega Bank Ltd announced its dividend on Wednesday. The payout includes 6.85 percent cash dividend and 1 percent bonus shares. Among advances, Kabeli Bikas Bank Ltd was the biggest percentage gainer of the day. Its share price surged to hit the upper circuit of 10 percent. Correspondingly, Vijay Laghubitta Bittiya Sanstha Ltd and Garima Bikas Bank Ltd rallied over 6 percent each. Further, securities including Nepal Seva Laghubitta Bittiya Sanstha Ltd, Lumbini Bikas Bank Ltd Promoter Share and Gurkhas Finance Ltd advanced 5.85 percent, 4.55 percent and 4 percent, respectively. In contrast, Ngadi Group Power Ltd turned in the worst performance of the day as its share price slumped more than 7 percent. Himalayan Bank Ltd also tanked almost 7 percent on the day. The commercial bank announced 10.79 percent cash dividend and 5 percent bonus shares on the day. Further, weakness was visible among microfinance stocks including NMB Microfinance Bittiya Sanstha Ltd and Mirmire Laghubitta Bittiya Sanstha Ltd which registered losses of 5.61 percent and 4.76 percent, respectively. Among other companies announcing dividends, Shangrila Development Bank Ltd declared its dividend for the fiscal year 17/18. The bank has proposed to distribute 4 percent bonus shares and 5.30 percent cash dividend to its shareholders. ARKS technical analysis indicates the index correcting for a second consecutive day. Hence, technical indicators suggest that the market is slightly losing its momentum. Nonetheless, the sentiment seems fairly neutral in the current juncture. The market is now resting on its support zone of around 1,160 points where a bounce back is likely. Nonetheless, the breach of the support zone might see the index hit 1,140 points mark. KATHMANDU, April 10: Nepal Stock Exchange (Nepse) ended in red on Tuesday despite trading marginally higher in the afternoon session.